Living a Fit and Full Life: GourmetGiftBaskets.com Has the Perfect Gifts For Grandparents Day (September 10th)! GourmetGiftBaskets.com Has the Perfect Gifts For Grandparents Day (September 10th)! New England is known for its hearty breakfasts that boast fresh and wholesome foods. And with this delightful arrangement, a classic morning meal from the North Country can be enjoyed anywhere at any time. Inside a gorgeous basket, your recipient will discover delicious foods, like Maine's juiciest blueberries, New Hampshire's sweetest maple syrup, and Broadbent's hickory-smoked pepper bacon, creating a lovely gift that's guaranteed to make any morning unforgettable. Farmhouse Pancake Mix by Stonewall Kitchen - 16 oz. - A gourmet mix of malted flour and rich vanilla that easily creates fluffy pancakes and light waffles. Pure New Hampshire Maple Syrup by Fuller Sugarhouse - 3.4 oz. - Grade A Dark Amber maple syrup that's won awards for perfect flavor, clarity, and density. (2) Perfect Potfuls Assorted Gourmet Coffees by Coffee Masters - 1.5 oz. - Rich, gourmet coffee that's already measured out, ensuring pots of perfection. Wild Maine Blueberries by Highland Sugarworks - 3.5 oz. - Delectable, wild blueberries that are harvested in Maine and packed in water to ensure freshness. Hickory Smoked Pepper Country Bacon by Broadbent's - 14 oz. - Award-winning bacon that's hand-rubbed with a special blend of pepper and dry cured to perfection. Wild Maine Blueberry Jam by Stonewall Kitchen - 4 oz. - A rich jam that's expertly crafted from tiny, wild Maine blueberries, the perfect amount of sugar, and a splash of lemon juice. Blueberry Crisp Mix by Fowler's Milling Company - 16 oz. - A delectable mix of the finest, all-natural ingredients that quickly creates a mouthwatering treat with the addition of fresh blueberries and creamy butter. Traditional Scone Mix by Stonewall Kitchen - 14.37 oz. - A traditional scone mix made from the finest all-natural ingredients. Raspberry Peach Champagne Jam by Stonewall Kitchen - 4 oz. - A vibrant spread of sweet peaches, tangy raspberries, and refreshing champagne. GourmetGiftBaskets.com has the perfect gifts For Grandparents Day! Did you know Grandparents Day is this Sunday September the 10th? I honestly had no idea as it's not really a holiday we normally celebrate, although it's the perfect way to let grandparents know that they're loved and appreciated. GourmetGiftBaskets.com has an amazing selection of gifts that grandparents are sure to love. 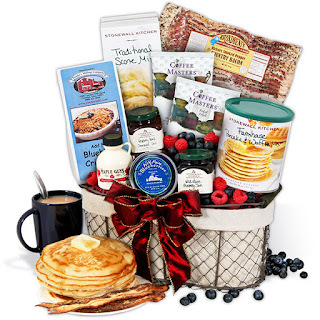 GourmetGiftBaskets.com's New England Breakfast Gift Basket Deluxe is an amazing gift basket filled with all sorts of delicious goodies! One thing I really like about this gift basket is that it's the perfect way to show up at the grandparent's house and whip them up an amazing breakfast. 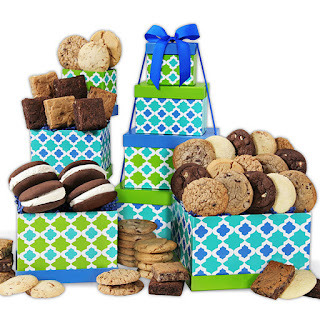 Even if grandparents are far away this basket will be a terrific treat for them! GourmetGiftBaskets.com will ship it to them so that they can prepare an amazing breakfast and think about their favorite grandchild while they enjoy it! From The Bakery Gift Tower from GourmetGiftBaskets.com is an incredibly delicious gift tower filled with all sorts of sweet treats! One thing I know about grandparents is that they sure do love their sweets. That's exactly why this From The Bakery Gift Tower from GourmetGiftBaskets.com will be a hit for Grandparents Day. It has an amazing selection of cookies, brownies and even whoopie pies. Whether you have it shipped directly to your grandparents or hand deliver it, it will surely be enjoyed! GourmetGiftBaskets.com is a terrific place to shop for gifts and is sure to please this Grandparents Day!